It’s been a pretty slow week around here at the DoD3. I’ve been busy with other obligations and focusing more on this site’s search engine visibility, plus a bit of writers block! But alas, the weekend is here and so is another installment of the Theme Park Crapstravaganza! 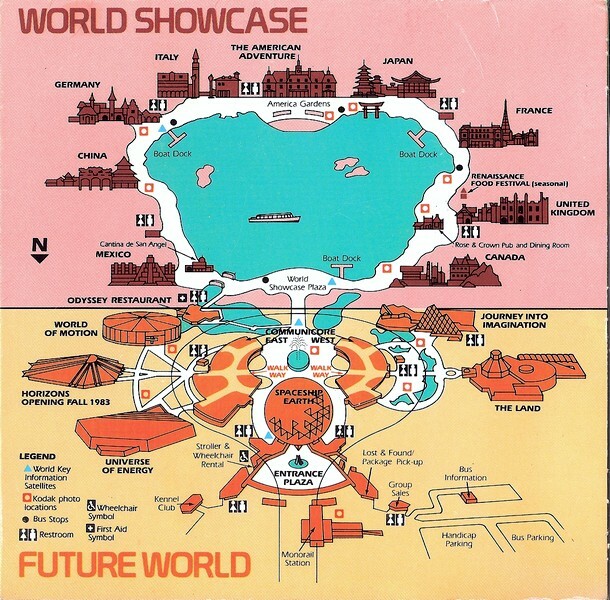 To make up for the lack of articles this past week, I’ll pull out arguably the best park map I have, a vintage 1983 Epcot Center park map. 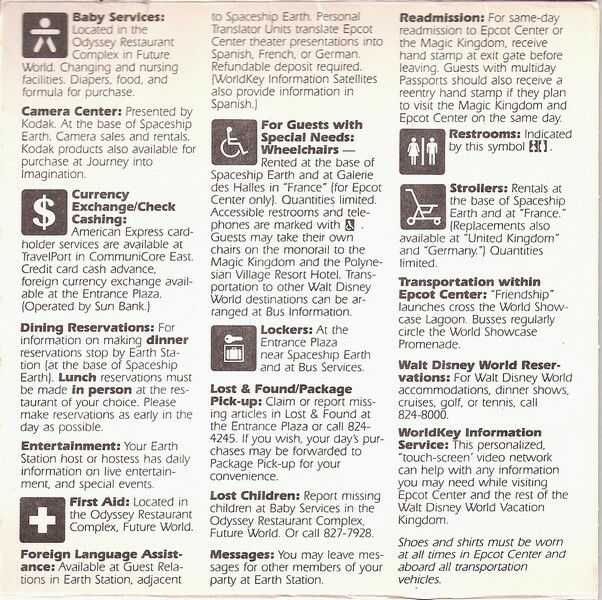 Unlike the previous Epcot park map, this one is lovingly kept in a plastic bag and put in a place where it won’t get crushed or ripped. 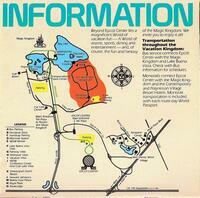 First let me say that this map is from the 1983 season which is one year after the park opened. I wasn’t even a thought yet in 1983 so I don’t have any stories to share from this trip! The cover, which is made from cardboard, features an awesomely 80s design with bright retro-tastic colors. 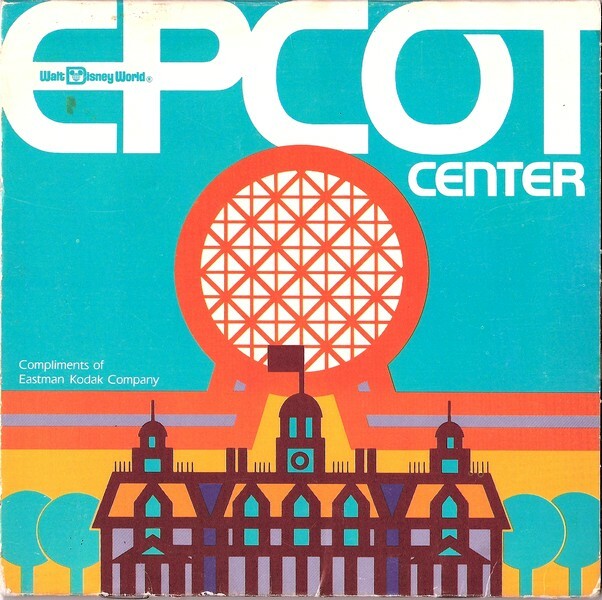 The cover simply proclaims “Walt Disney World Epcot Center.” Back then the name was EPCOT Center, with EPCOT being an acronym for “Experimental Prototype Community of Tomorrow.” Today, the park is simply known as ‘Epcot’ with the acronym notation as well as ‘Center’ being dropped. 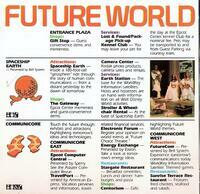 Two Future World pavilions, Living Seas and Wonders of Life, were not around in 83. Horizons was there but still under construction. 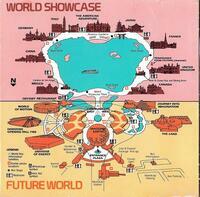 In World Showcase, the Norway and Morocco pavilions have not been built yet. Here’s a nifty little feature; it’s a cardboard wheel that can be spun to show what every pavilion has to offer. I have it stopped on World of Motion among other things. All right, page two! This one features all of the pavilions that surround Communicore and Spaceship Earth. First up is Universe of Energy, which at this time did NOT feature Ellen’s Energy Adventure, but rather just ‘Universe of Energy.’ I have heard from a few places that it was a bit boring, and of course I’ve heard the opposite. 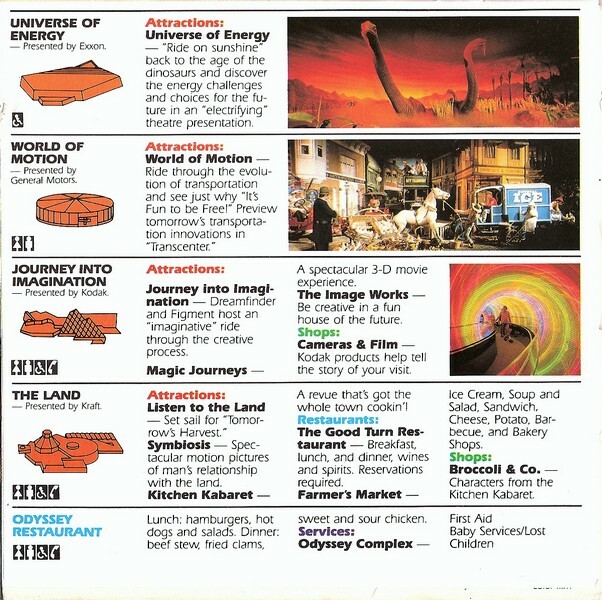 One thing is similar though in that both attractions had the famous ‘Dinorama’ segment where the theatre moves through a primeval mock up.Next is World of Motion, a journey through the advances in transportation, starting with the wheel and ending with futuristic cars. World of Motion closed in 1996 and was re-opened in 1999 as Test Track. 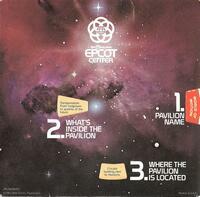 Underneath is Journey into Imagination, which had just opened in 1983 after being standing but not operating in 1982. 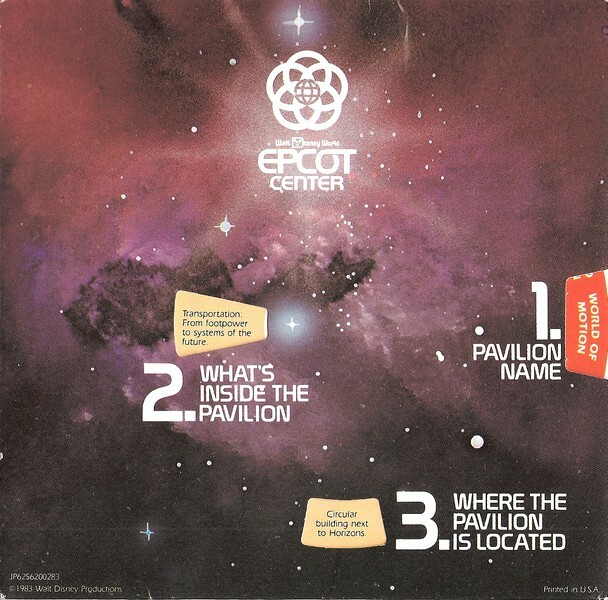 The pavilion featured the Journey into Imagination dark ride, ImageWorks; which resided up in the pyramids; and Magic Journeys, a 3D show. 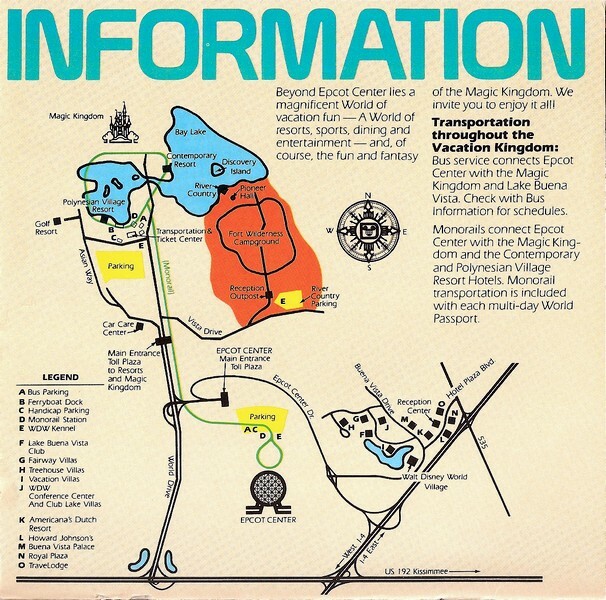 In 1986, Magic Journeys was replaced with Captain EO, featuring none other than Michael Jackson. Next is The Land, which featured Listen to the Land, now called Living with the Land; Symbiosis, now known as Circle of Life: An Environmental Fable; and Kitchen Kaberet which was replaced by Food Rocks in 1994, which itself replaced by Soarin’ in 2005. 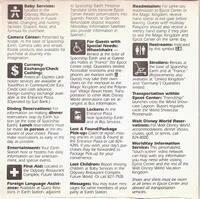 Last but not least is Odyssey Restaurant, which was actually a functional restaurant back in ’83. Today, Odyssey is just that strange brutalist looking building that sits between the Mexico pavilion of World Showcase and Test Track and is never open…well, I think it opens for special occasions. 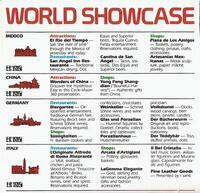 What’s a World’s Fair without some countries represented? 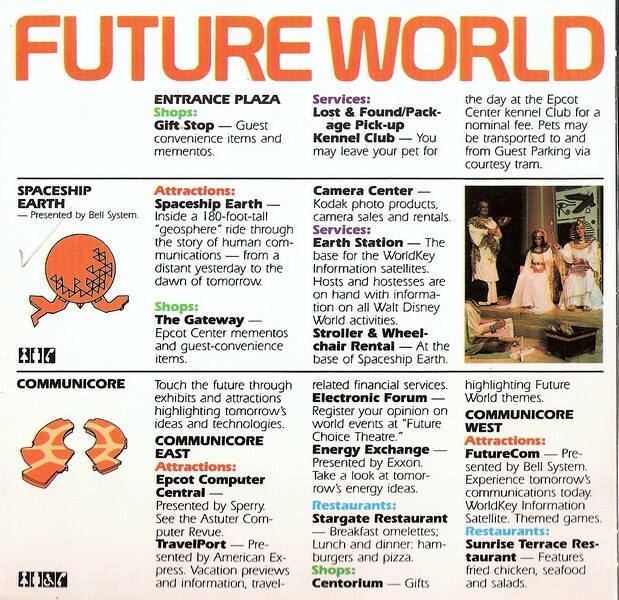 At one point Epcot was disregarded as just a World’s Fair type of park, but now since World’s Fairs never happen anymore, I’m glad it’s (allegedly) modeled after one! First the Mexico pavilion which sat largely unchanged until 2004 or so. Outside, the Mexico pavilion is simply a mock up of an Aztec temple; inside, the pavilion is themed to a small Mexican city square at night complete with restaurants, vendors and even a boat ride. If you spent a bit of time inside the pavilion, it’s not uncommon to walk out and be shocked that it’s still daylight out since Disney did a good job with the theming inside. Next is China, which again hasn’t been changed a whole lot. They did update the Wonders of China movie, turning it into Reflections of China, and added in some restaurants. 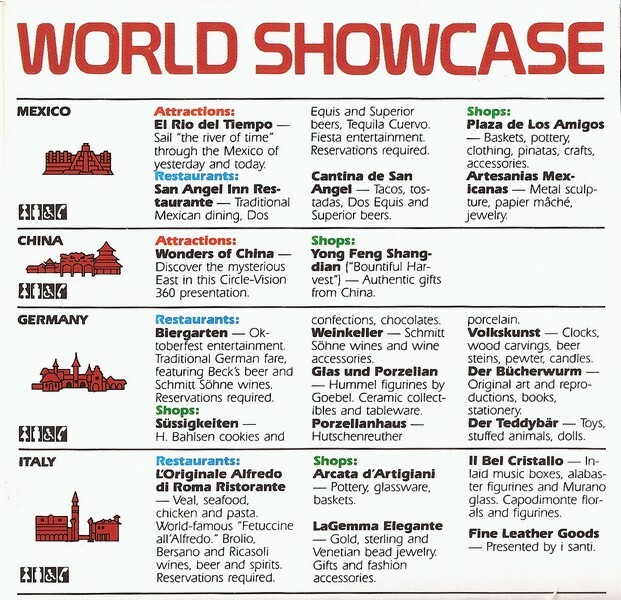 The Germany and Italy pavilions, aside from a few shop/restaurant changes are the same. First up on this page is The American Adventure, which still features the American Adventure animatronic show and a restaurant. I believe American Adventure and Mexico are the two pavilions that have no notable outside areas. Japan is next, which according to Wikipedia, was slated to have some attractions but all were scrapped before opening. Apparently they even went as far as to build a Circle-Vision theater which was left unused. Now it simply has dining, street shows, and shops. 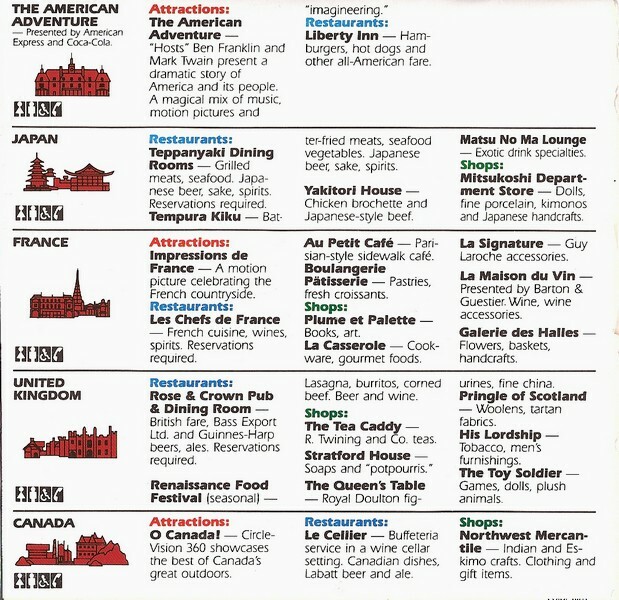 The next world locale is France featuring Impressions de France as the main attraction in 1983, a show that continues to run to this day. The pavilion also has a replica of the Eiffel Tower (a requirement for any French themed place) some shops and dining. United Kingdom is kind of a weird pavilion as it resides around the main path, as opposed to an offshoot from the main path. The pavilion was and still is all dining and shops with some small shows. Finally there’s Canada, with its attraction O’Canada, a Circle-Vision film. 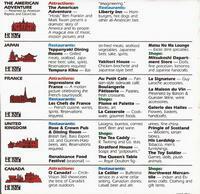 It also had the Le Cellier restaurant, which is still around today, which has some great food! 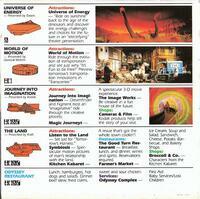 The last page of the park map is the backside of the cardboard wheel featured on page three. 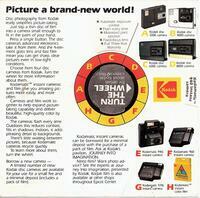 It’s just a big ad for Kodak using the wheel to show the features of their cameras. 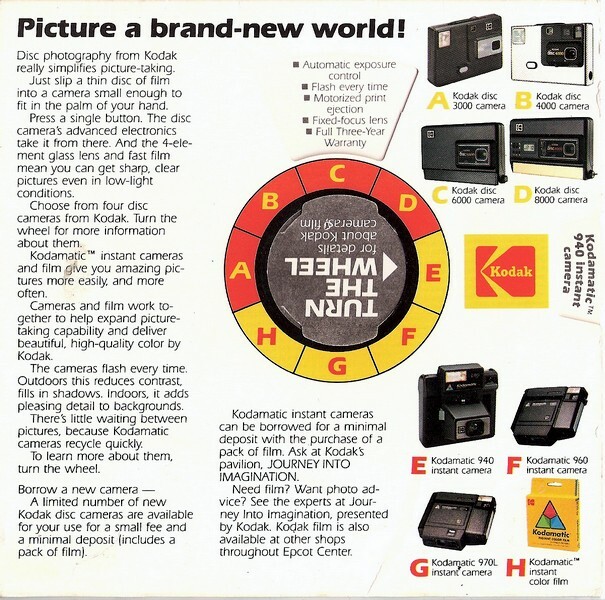 Just look at all those old boxy cameras! ← Jimmy Want’s the Truth!